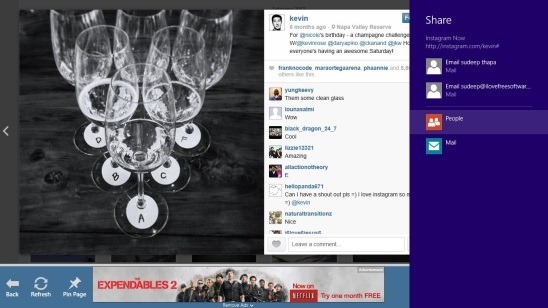 Instagram Now is a free Instagram App for Windows 8. 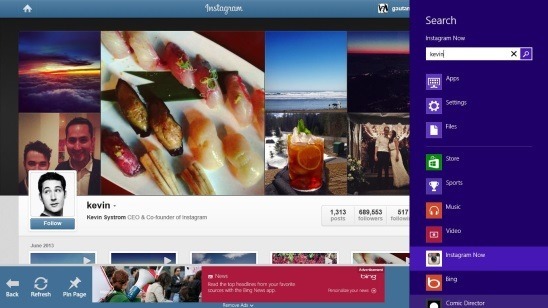 This app is an imitation of the Instagram web app, that is Instagram on web browser reformed into Windows 8 App. This app lets you access your Instagram account on your Windows PC without opening the browser, and upload or share photos with other Instagram users. You can view the latest feeds of your followers and people whom you follow. The app lets you browse for people and then follow them; plus you can browse to get some awesome photos uploaded by other Instagram users. You can also like and comment on these photos. Besides this, you can search and share images using the Windows Search and Share Charm respectively. In order to have a quick access you can also set people as your favorites and pin different pages to your system’s Start screen. This free Instagram App for Windows 8 is available under the Social Category in Windows Store. 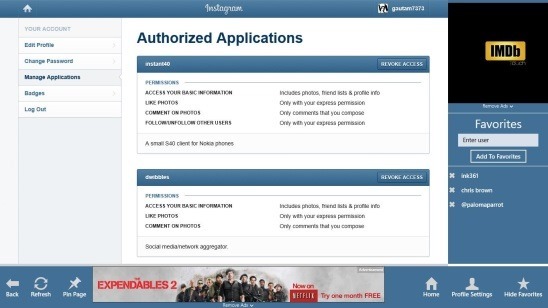 As you launch the app, the first pre-requisite is that you need to have an Instagram account; people who don’t have an Instagram account, can’t use this app at all. After you sign in with your credentials you’ll get the app’s main screen. This screen looks fine, and you can access everything from this screen itself! There are buttons at the bottom of the screen which are quite practical. The buttons include: Home, Profile Settings, Show/Hide Favorites, Back, Refresh, and Pin Page. The interface is relatively neat, specially when you hide the favorites flyout, because the favorite flyouts comes with ads. Though, there are also ads at the bottom of screen but they are quite unnoticeable. Browsing through the app and doing stuffs is very much same as they are in web version. Since this app is an imitation of Instagram on web browser, you can do only those stuffs which you are allowed on your Instagram web account. This includes: viewing all latest feeds which people have shared with you, browsing through profiles and photos, like and comment on the posts, and change profile settings. But features that makes the app really great and which you won’t find while using Instagram on web browser, are: options to pin pages to your start screen (which includes your favorite peoples’ profile page and posts as well), searching for people using Search Charm (Win + Q combo) with whom you are already connected to or other users as well, share pages with friends using the Windows Share charm (Win + H), and adding people to favorites within the app for quick access. These features add a lot more functionality to the app. Good Instagram App For Windows 8. Browse through feeds, people, and photos. Search for people having public profile using Search Charm. Share pages with friends using Share Charm through email. Pin pages to start screen. Simple, clean, and easy to use. 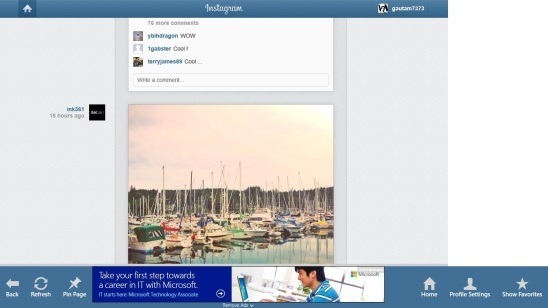 Instagram Now is a handy free Instagram app for Windows 8. It has got good functional set of extra features, and can be a great substitute for the official Instagram web app for Windows 8 users. Above all, it’s easy, quick, and free. Should try this app!